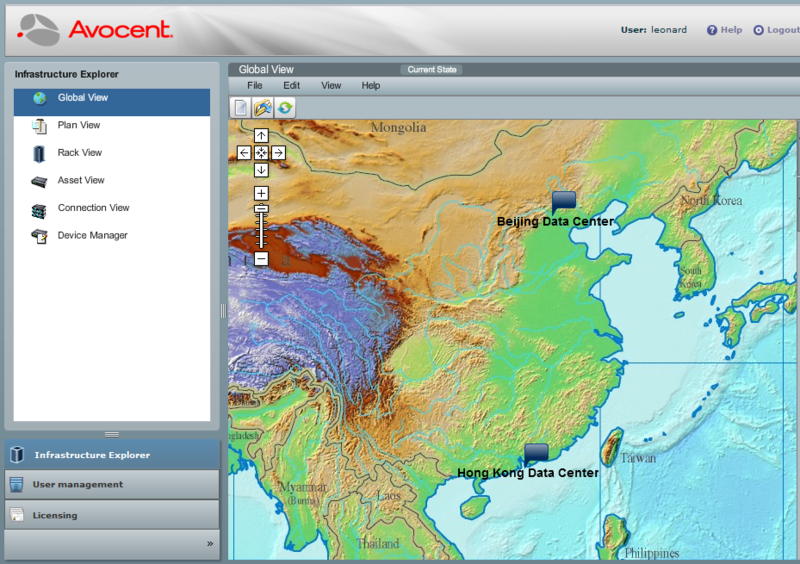 Global View: a Google Map like map view to locate your data center. Plan View: a floor-plan, bird's eye-view to visualize the layout of your equipment rooms. Rack View: a visual rack view to see what is sitting inside your rack. Asset View: see all properties related to this asset such as owner, serial number, warranty status, as well as a wealth of manufacturer defined properties predefined by within all assets defined Avocent's comprensive library. Connection View: define and track each connection between all your assets. Device Manager: Comprehensive view of your asset details. Know, plan and manage your...everything. More than just pretty pictures. More than reams of cold statistics. MergePoint Infrastructure Explorer 2.2 software brings together the best of all planning systems to provide a rich, dynamic, graphic view of your data center(s), racks and individual IT assets within the rack. Its interactive screens deliver detailed, visual information that aids in day-to-day operations and maintenance activities, while reducing the time to respond to issues and plan changes. Plus, it enables more trustworthy and comprehensive capacity planning. Be ready for whatever comes your way. Today. Next week. Next year. Plus, with the reporting and data gathered, you can know exactly where assets are in the data center based on service tag, host name, manufacturer and other criteria. New for Version 2.2: Reservations, Intelligent Asset Placement and Rack Timeline offer a unique view into capacity management. Visual Modeling: Provides a graphical view of the data center(s), racks and individual IT elements within a rack. Detailed visual information aids in the day-to-day operations of the physical data center. Planning and Design: Allows for creating multiple “what-if” scenarios to understand the impact of a change or addition to the data center. Impact Assessment and Analysis: Allows for comprehensive analysis of all Requests for Change by identifying the equipment, applications and business lines that may be affected by that change. Asset Identification and Location: Enables you to search for assets by type, domain name, IP address, etc., providing the physical location in addition to other general asset information. Also provides specific information for locating a device (i.e., recalled power supply type-x and visual indications of which racks and servers need to be worked). Capacity Visualization and Planning: At-a-glance view of available capacity and potential issues for space, power, weight, heat/cooling and network ports. Provides accurate information for planning and reduces time needed to implement additions and changes to the data center. Asset Library: High-fidelity images of assets provide data on size, weight, power usage, heat output, etc. 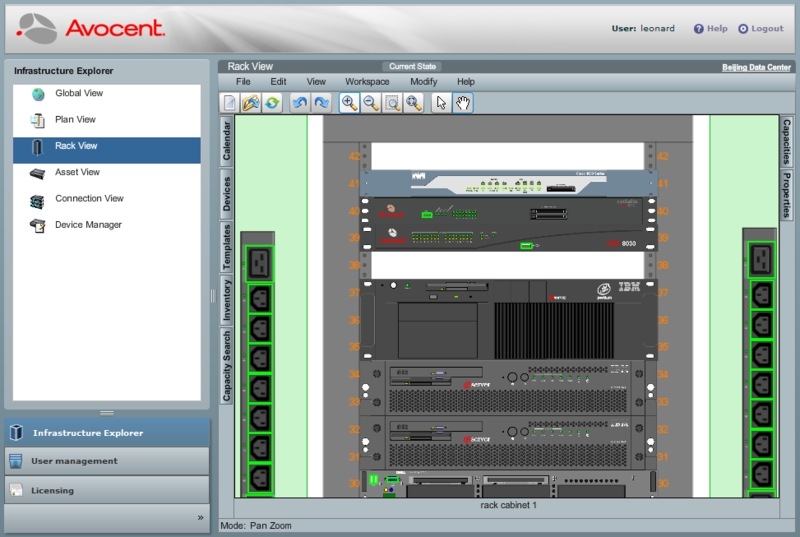 Feeds data center capacity metrics and shows details of assets for hands-on operations and maintenance support. Data Import: You can import data center information in a Microsoft Excel® format for an ease of implementation. In addition, MergePoint Infrastructure Explorer software offers standards-based integration via Web services. 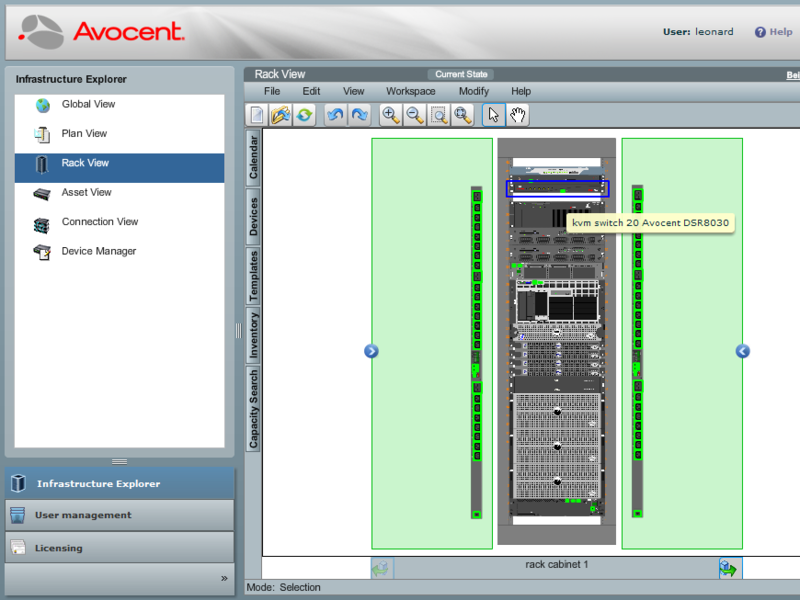 DSView 3 Software Integration: You can launch KVM or serial sessions to assets connected with Avocent hardware, transforming the tool from a visual-planning and recording tool to a functional interaction with the environment. Reporting: Provides visibility into assets, business line costs, capacity utilization and impact analysis.